8.1 / 10 based on 15 reviews. Of the 15 people who reviewed this product 100% would recommend it. Fairly simple to use and feels pretty safe. Relatively easy to fix. People find it hard to put the black plastic loop on the top back over the catch so it's often left flapping. Would prefer code only to work in sequence eg 2438 rather than any combination of the four numbers. Small, unobtrusive, easily installed and convenient to use. A wee bit more space inside, maybe for a couple of extra keys our perhaps a computer flash stick, would have been welcome. That said, the space was as advertised. Very solid piece of kit, with a very robust and close fitting rubber cover to keep out the rain. 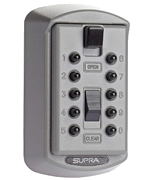 Good quality combination lock with six digits. It is designed for the key to be attached to the combination pad so that it is difficult to lose the key. This means the whole front of the unit detaches and it is quite fiddly to get it all back together again. Good Quality product; fit for purpose. Odd size Fixing kit for drill size required ? Solid build, small neat size, good weatherproof cover. Excellent service. E-mails tracking delivery much appreciated. Prompt delivery which meant product arrived and could be fitted in time for patient coming home. Solid, well-constructed. The fact you have to dial the code to enable you to close the safe once it's opened. The plastic casing is a little difficult to put back on. Quality build. Chubb type keys are difficult to store, also a bunch of keys are difficult. Discrete, rubber case, secure wall mounting. Fiddly to open, limited space for keys, can't repeat numerals in the access code. Everything about it is ideal for our purpose. Really pleased and will be ordering the same model for another property. This product has 15 reviews.